You can customize your storefront with a custom navigation menu. You can create additional pages, edit product category names, change page URLs and change the visibility of your product offerings. The added customization will enable you to use industry-specific keywords and enhance your customer’s experience. Note: Custom additions to your menu will not be translated and will be presented to all markets in the language you have used to customize your menu. 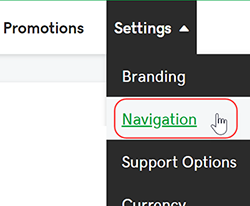 From the top menu, click Settings, then click Navigation. Click the eye icon to left of the product category to hide or show the entire product category. Note: The top-level category names will show in your primary navigation menu. The product sub-categories will show as drop-down options under the top-level category. Click Add New Category at the bottom of the page to add a new product offering page and fill in the required fields. Click Add New Link at the bottom of the page to add a custom page to your storefront (i.e., an About Us page). To confirm your changes, click Publish at the top of the page. If you're using the WordPress plugin for your site, be sure to update your permalinks. Posso utilizzare il nome di dominio mascheramento per la mia vetrina rivenditore?